We wish to inform you that The UN, AU, ECOWAS, WAMA and IMF in collaboration with Ghana Reserve Bank has instructed AGRICULTURAL DEVELOPMENT BANK GHANA to proceed on the transfer of your pending fund amounting US$60 million to you with out any delay. We therefore advice that you to stop further communications with any corresponding bank outside this office to ensure the successful transfer of your fund to your nominated bank account. Regarding the mode of transfer recommended, you are therefore requested to activate your account with our bank to online account to enable you transfer your fund your self to any bank account world wide. So kindly fill the space below and return with payment information of US$97 only, which is our initial deposit of a new online account before the activation of your pending fund for online transfer. Be rest assured this is the only payment that will be required from you, 100% guarantee. Full Name:. . . . . . . . Identification No :. . . . Date of Birth:. . . . . .
Marital Status:. . . . . .
Next of Kin:. . . . . . .
Full Address:. . . . . . .
Telephone:. . . . . . . .
SENDER NAME:. . . . . . . TEXT QUESTION:. . . . . . TEXT ANSWER:. . . . . . . Upon receipt of the aforementioned information, we shall be sending our Online account login details to you in less than 6 hours, which you will use to transfer your fund to any local bank account world wide. Your can send the fee to (ISAAC OGHENERO) country ACCRA GHANA. TEL: +233 263 700 069. Subject: WE NEED YOUR URGENT ATTENTION. This is to bring to your notice that we received an instruction from the united nation, by orders of the ministry of finance, republic of Ghana to release your approved payment of US$60 million dollars viaAGRICULTURAL DEVELOPMENT BANKATM visa card which you will use to withdraw your US$60 MILLION DOLLARS from any ATM machine in any part of the world. 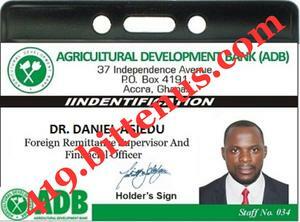 We must assure you thatAGRICULTURAL DEVELOPMENT BANKATM visa card has been approved and upgraded in your favor, The amount upgraded into the ATM visa card is us$60 million dollars and your secret pin number will be given to you once you received the card from us. Right now, invitation have been extended to you to visitAGRICULTURAL DEVELOPMENT BANKRepublic of Ghana Head Office for collection of your ATM visa card and pin number so that you can activate it by yourself and start withdrawing funds from any ATM machine world wideaccept Africa for security reason. The maximum amount you can withdraw daily is US$10,000 dollars only, also you can transfer any amount or the total fund to any private account of your choice world wide. Alternatively, if you are unable to visit AGRICULTURAL DEVELOPMENT BANKRepublic of Ghana Head Office for collection of your ATM visa card and pin number, you must therefore apply for our courier service agent at your own expenses by offsetting for theshipment, insurance and vat fee, totally US$57 only. These must be paid first to enable us ship the ATM visa card to your address to enable you start withdrawing your US$60 million dollars from any ATM machine in any part of the world. The ATM visa card must be insured for security reason, so that it can get to you without any problem and diversion because this ATM card can be use to withdraw funds from any ATM machine world wide. Lastly, If you cannot come toAGRICULTURAL DEVELOPMENT BANK head officefor collection of your ATM visa card, you must therefore try and send the requireshipment, insurance and vat fee to (Daniel ASIEDU) address (ACCRA GHANA) then get back to us with payment information, so that we can dispatch your ATM visa card to you with out any delay. Be rest assured with in 48 hours your ATM visa card will arrive to your address and youcan start withdrawing funds that same day you receive the card from any ATM machine nearest to you. Executive Director ADB Bank Ghana. Telephone: +233 207 971 241.